The draft came back around to me just in time! I'm off to SFO in a couple hours to board a plane to London, but before I go, I'm going to snag a landmark film. Metropolis. The godmother of science fiction filmmaking. It has slipped in and out of the public domain. It has been edited and updated and recompiled and restored across the decades. Thus, there are many versions. But the original 1927 cut is a masterpiece of German expressionism. The ripples it cast across film as an artistic medium can be seen everywhere. Many of the films in this very draft are counted among its aesthetic and thematic offspring, from Star Wars to Blade Runner (and its sequel) to The Matrix. 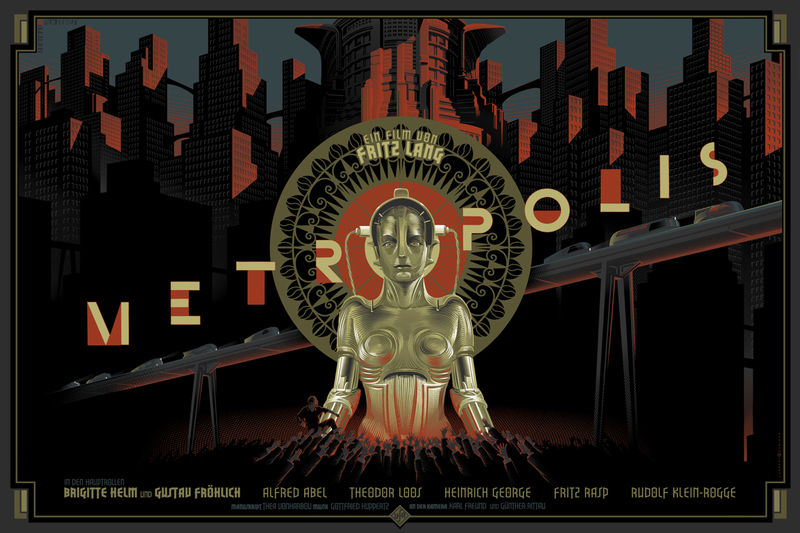 As a silent film, Metropolis must tell its story almost exclusively in images. The silent film era was such a tremendous boon for visual storytelling, before dialogue came to rule the day, and this particular silent film is a must-see for all fans of film history, no matter which version you approach. 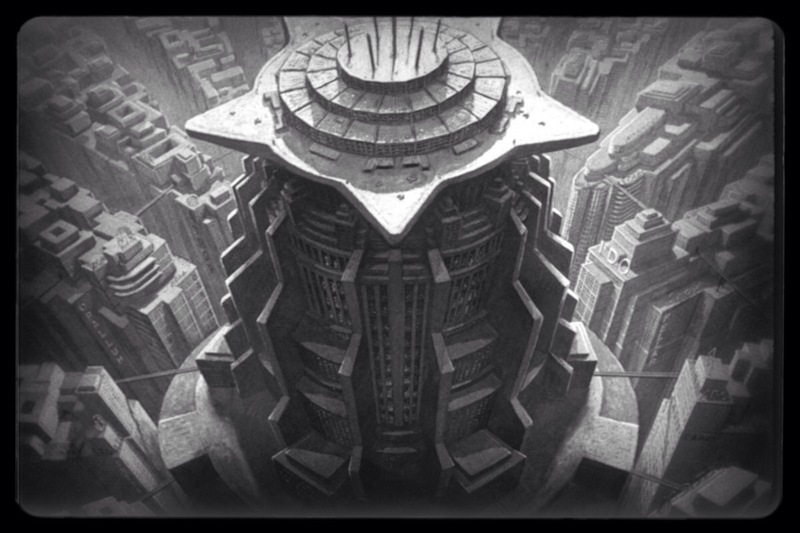 Much like Dickens' A Tale of Two Cities, Metropolis is about the socioeconomic stratification of the rich and poor. The film depicts a city (belonging to some unknown future) where the underclass toils away in its depths, tending to the machines of industry, while the upperclass lives a life of luxury amongst its high rises. I'm afraid I haven't the time to invest in a lengthy write-up for this film, one of the most important of its era. Suffice it to say that its set design is magnificent, its use of early special effects are extraordinary, and its influence cannot be overstated. There are few films from the 20's that forecast not only the kind of future we would eventually come to inherit, but also the very soul of ambitious, cerebral filmmaking. Without Metropolis, the rest of my draft picks could never be. Yes. Perfect cap to your sci-fi anthology. Dark, hilarious, biting high school satire. I can probably quote 90% of this movie. Narrator: Humans avoid the deep Kalahari like the plague because man must have water to live. So the beautiful landscapes are devoid of people, except for... the little people of the Kalahari. Pretty, dainty, small and graceful... the Bushmen. Where any other person would die of thirst in a few days, they live quite contentedly in this desert that doesn't look like a desert. They know where to dig for roots and bugs and tubers, and which berries and pods are good to eat. And of course they know what to do about water. For instance, in the early morning you can collect dewdrops from leaves that were carefully laid out the previous evening. Or a plume of grass can be a reservoir. If you have the know-how, a clump of twigs can tell you where to dig, and you come to light with an enormous tuber. You scrape shavings off it with a stick that is split for a sharp edge. You take a handful of the shavings, point your thumb at your mouth and squeeze. Narrator: The one characteristic which really makes the Bushmen different from all the other races on earth is that they have no sense of ownership at all. Where they live, there's really nothing you CAN own: only trees and grass and animals. In fact, these Bushmen have never seen a stone or a rock in their lives. The hardest things they know are wood and bone. They live in a gentle world, where nothing is as hard as rock, steel or concrete. Narrator: That morning, Xi saw the ugliest person he'd ever come across. She was as pale as something that had crawled out of a rotting log. Her hair was quite gruesome; long and stringy and white, as if she was very old. She was very big - you'd have to dig the whole day to find enough food to feed her. Narrator: Although it was a hot day, she was covering her body with skins that looked as if they were made from cobwebs. She was doing strange and magical things, and it struck him that she must be one of the gods. He wondered what she was doing down here on earth. But he was glad he met her, because now he'd give the evil thing back to her and go home to his family. So he said tactfully that he didn't need the thing, and that she could have it back. But she was very rude, and she walked away. Narrator: - in fact, it's delicious. And the skin makes a fine pouch. Kate Thompson: Fine, thanks. How are you? Steyn: Fine, thanks, and how are you? Kate Thompson: I'm fine, thank you. Kate Thompson: [Steyn drops the cup he's picked up, tries to catch it, and knocks it into Kate's face] Watch it! Steyn: [Tries to stand up but knocks the entire table over. He picks up the table and tries to pick up all the items and put them back on the table while he speaks, but is unsuccessful... ] It's actually... actually, it's really only an interesting psychological phenomenon. Perhaps it's some Freudian syndrome. When I brought you your shoes, I came to apologize for the stupid things I did when I met you at Mabula. To explain that I'm not as stupid as that. But then, of course, I blew it, and I... so I don't blame you if you think... but it's really only an interesting psychological. When you get to know me better, you'll see that I'm not always stumbling. It's really just an interesting psychological phenomenon. Kate Thompson: Yes, you are a very interesting psychological phenomenon. And I think you're very sweet. The surprise bonus pick gives me the chance to finally take a movie I've been alluding to but have consistently passed until technically after the draft ended. While the movie as a whole is great, there is one scene in particular that is so phenomenal, I seem to stop breathing every time I watch it. With this film I round out my draft with the previously mentioned Soderbergh/Clooney partnership in the movie that launched both of them into cinematic mainstream success. Also, Jennifer Lopez is legitimately good in it. And Michael Keaton has a fun cameo, so there's that. A lot went right for this film that went against contemporary conventionally wisdom. Soderbergh had been exclusively an indie art house director and Clooney was little more than a TV star whose break into film had debatably flopped. Plus, the film was based on an adapted script from Elmore Leonard, whose work had proven difficult to translate into big screen success. Yet, here a seemingly simple, straight forward story of a con and a cop falling in love despite their respective interests sizzles due to Clooney's charisma and the tough, professional, and beliavable performance of Lopez. And it all culminates in the scene mentioned above, where an intimate conversation between the cop and the con finally connects the two as they take a time out from playing cat and mouse and get together in the most simultaneously stylish and romantic scenes I've ever witnessed. This is a perfect example of the age-old axiom that pretty much anything spoken in an English accent is approximately 10 times funnier than the same statement with an American accent. I don't exactly know why it's true but it is. I wonder if the same is true on the opposite side of the pond? Any Brits here that can confirm or deny? pretty much anything spoken in an English accent is approximately 10 times funnier than the same statement with an American accent. Could it be simply for the fact that British humour is 10 times funnier than American humour? I hoped you pick this movie. I only included my 8 all time favorites (three slots for meeting the requirements, two for fun picks) and Metropolis just missed the cut. It's your privilege to comment on it and choose pictures, so please excuse me for posting this classic image. I can't believe I forgot about this flick! I may have to drop by your cabin to watch it once in a while! More popcorn flicks for my list. This is currently my favorite movie, so I'm bringing it to my cabin! Wow. I am so incredibly happy I opted for a bonus pick. TONS of excellent films in this round that would have been left out. REMINDER: I have given Bajaden the final pick in the draft. I can't believe we all forgot about this one. I am ashamed of myself, but at least that was a player everybody slept on. Ben Wallace of our draft. Great, great pick Jespher! This classic drama/history flick features Peter O'Toole, Katharine Hepburn, Anthony Hopkins and Nigel Terry. This film won 3 Oscars, including Best Actress for Katharine Hepburn, Best Screenplay, and Best Original Score. Eleanor of Aquitaine: And when you die, which is regrettable but necessary, what will happen to frail Alais and her pruny prince? You can't think Richard's going to wait for your grotesque to grow. Henry II: You wouldn't let him do a thing like that. Eleanor of Aquitaine: Let him? I'd push him through the nursery door. Henry II: You're not that cruel. Eleanor of Aquitaine: Don't fret. We'll wait until you're dead to do it. Eleanor of Aquitaine: Just what you want, a king for a son. You can make more, I can't. You think I want to disappear? One son is all I've got, and you can blot him out and call me cruel? For these ten years you've lived with everything I've lost, and loved another woman through it all, and I am cruel? I could peel you like a pear and God himself would call it justice! It's a great addition to the Joker's cabin! Tlhank you, bajaden. The only thing I would add is that both O'Toole and Hepburn were nominated for best actor. Hepburn won, but in a tie with Barbra Streisand for the movie Funny Girl. O'Toole, one of my all time favorite actors was nominated for best actor 8 times, and never won. In my humble opinion, he got cheated out of an Oscar his first time out when Gregory Peck beat him out for his work in To Kill a Mockingbird. While Peck was very good, it didn't compare with O'Toole's performance in Lawrence of Arabia. I think Hollywood did it's usual, knowing that Peck was at the end of his career, and O'Toole at the beginning, gave the award to Peck. By the way, O'Toole is the only actor to play the same person in two different movies. He played King Henry the II in Becket, and again in Lion in the Winter. At two different times in his life of course. I had a feeling this would be his choice. This movie is all about the dialogue (mainly between the King and Queen). Excellent screen play. That's why I picked that particular quote, one of my favorites. I read somewhere that the dialogue was adapted to meet the personalities of O'Toole and Hepburn. No wonder it won an Oscar. Bravo this was an excellent choice! Your write-up is inspirational. NOTE: At this point in the process, each of the participants needs to rank their competition. Take a bit and review each of the Cabins. Then, when you have a chance, send me a PM with your rankings - from 1 to 15. DO NOT INCLUDE YOURSELF. In addition to the 15 participants, I would like each of the Joker pickers to do the same thing. This will determine the seedings for the playoffs. Again, the only people who should be sending me rankings are those who actually made draft picks. Thank you. As this will take a few days at least, I'd like to encourage all of you to feel free to share your "didn't quite make the cabin" lists if you have them. I don't know about anyone else, but I've got some movie watching to do. I know not every film will be to my taste, but I'm going to try and at least view trailers for as many of the ones I don't recognize as I possibly can. Then it's time for a trip to the video store. I don't want to start the actual voting process until all our participants are available...it wouldn't seem right to deny Padrino his playoff participation when he has done such an incredible job of writing up his reasons for each of his picks. Okay, I'm just rambling but maybe we should do something like Big Brother and have each person make a post about why they think their cabin is worth visiting? Feel free to chime in. The piano. (Good but I opted for Once were warriors instead). Fire in Babylon (West Indies Cricket). The consequences of love (Italian film. Almost my bonus choice). Dans Paris/ Inside Paris. (French film. A small family. A bit indulgent but ++ well performed). My beautiful laundrette/ the mother/ le weekend (I like Hanif Kureishi’s screenplays). Intimacy (Prob my fave film. Based on stories by Hanif Kureishi but the screenplay not his. Contains some content that could have made it ineligible so not picked). Smoke. (really great Christmas film. One of the few films my dad has conceded enjoying). Birdman. (Movie about making/ creating). Streetcar named desire (was my backup to midnight cowboy). East of Eden (was my backup to the above backup). The fugitive (Really great thriller). Tinker Tailor Soldier Spy. (I like John Le Carre films. Not quite at a threshold for selection though??). Senna. (Good doc. At this point it is like … lots of good films that are fun to watch and I would watch again. But what do I want in the thread? The brief was what do you want in your cabin, so anything would be good. But there was also some temptation to represent who you are (and to not do so as well). The Abyss (1989): The story of how this movie was made is even more compelling than the movie itself, which has its problems but is still incredibly entertaining. Ed Harris is fantastic in this and the constantly underappreciated Michael Biehn going off the deep end (no pun intended) with nukes is one of my favorite performances ever. And for all the talk of pioneering digital effects, its the miniature work here that I find particularly mesmerizing. Omitted because: I wanted a Terrence Malick movie more at #12 and a comedy at #13. Beverly Hills Cop (1984): This came very close to being my last pick. The jokes still land 34 years later, the soundtrack is iconic, and the development of the relationship between Axel and the cops assigned to follow him -- Billy Rosewood and Sgt. Taggert -- is genuinely touching. This might not be Eddie Murphy's funniest movie but I do think it's still his best. Omitted because: Romancing the Stone has got a cooler setting. The French Connection (1971): This has got everything I want in a crime film ... an interesting lead character, a clever antagonist, several exciting chase sequences, and an ambiguous ending. Simple pleasures for sure but the kind that never get old for me. Omitted because: One William Friedkin thriller was enough and I actually do like his movie Sorcerer a little bit more -- yeah I know it's a total dude movie so it won't be for everyone but Sorcerer seriously achieves the highest possible (Alfred Hitchcock) level in at least three different suspense sequences and that's very hard to pull off. The Social Network (2010): This was going to be my pick for the current decade but I already had one David Fincher drama and I wanted to acknowledge a lesser known film that I really wish more people had seen instead. I think this is a flawlessly executed expose of my generation -- the good, the bad, and the ugly -- and a movie that tends to make me very introspective every time I see it for that very reason. I was in college at the same time that Mark Zuckerberg was and the story of his creation of Facebook is a tragicomedy for the ages -- the wholesale outsourcing of all the social baggage that comes with being in school into a very sad and very public echo chamber. Everyone talking at once and nobody listening. Omitted because: Got cold feet on this one. Perhaps its a little too clever for its own good? Also, The Place Beyond the Pines is a little prettier and ultimately more optimistic. Stranger Than Fiction (2006): This was almost my last pick too. I'm not even a big Will Ferrell fan but he's so note-perfect as this guy in a suit living a meaningless life working at the IRS until fate throws him a curve ball and he seizes his chance to be something more. I love this script so much and it's basically scored with songs from the band Spoon which is awesome. Also every supporting role is perfectly cast. The scene where Harold Crick goes over to Ana Pascal's house and softly plays a punk song on her guitar is one of my favorite scenes in any movie ever. Omitted because: I wanted a second 80s movie on my list more. Paradise Now (2005) and Promises (2001): These movies are like companions to each other and I wasn't going to have room for both of them so I didn't end up picking either. I highly recommend them though. And while I don't want to make any kind of political statements about what is a highly emotional issue, I feel like both of these movies have strong positive messages which speak for themselves. Paradise Now is an account of a suicide bombing told from the point of view of the bombers and it is highly empathetic while not excusing the act itself on any level. Promises is an uplifting documentary which follows a number of kids in Israel and Palestine whose inherited biases are put to the test when the filmmaker asks them to accompany him across the checkpoint to meet each other for the first time. It's a movie that will re-affirm your faith in humanity and maybe even cause you to question how many of your own beliefs are built on tenuous ground. Omitted because: Hard to square the subject matter here with my other choices and ultimately not enough picks to go around. Drunken Angel (1948): My favorite Kurosawa movie. It felt terrible to omit one of the directors I've studied the most but his work was so well-represented on other people's lists that I just didn't see the need. 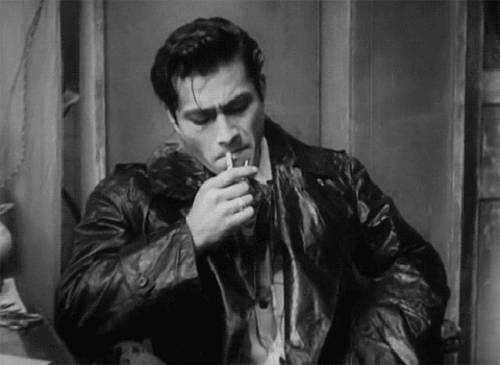 While Kurosawa is best known for his samurai films, some of his best work was in other genres such as the moralistic police procedural High and Low, the poignant bureaucratic melodrama Ikiru, and this seminal early-career Film Noir which features a memorable star turn from Toshiro Mifune and a raw and sometimes difficult look at post-war Japan. This is as perfect a Film Noir as I've seen -- all the themes are there -- and the fact that it's set in a bombed-out Tokyo only makes it that much more heartbreaking to watch today as an American. Omitted because: I'm an idiot. This absolutely should have been one of my picks. Don't ask me which movie it should replace though. Children of Men (2006): Alfonso Cuaron's masterpiece, this is a movie that truly takes you on an unforgettable journey! That wandering point-of-view camera Cuaron is so fond of reached it's absolute zenith here with multiple choreographed set-pieces that you need to immediately rewind and watch again because you can't believe how much they managed to pack into one shot. Add to that a stellar cast and a story about hope in a world devoid of hope and this is a celebration of everything that makes movies worth watching. Omitted because: Just not enough picks to go around. The draft was fun. I made sure to watch all the movies I drafted, along with other candidates, before doing my write ups. I'm glad I got to include my eight all time favorite films and give my takes on them. It was nice to be reminded just how amazing they are, and I feel with each viewing, and the older I get, the more I can appreciate them. Strangely, my list would look exactly the same if I had the first 13 picks in the draft. I didn't make a list before the draft but if I had to make my next seven picks right now, it would be the movies listed below. I may have broke the rules by including Dog Star Man. The film was released in five parts over the course of four years, and I doubt it was played in many theaters as it's quite avant-garde. But it was released in an anthology as part of the Criterion Collection, and it's on youtube so it's easy to find. I still really hope some of you watch it. I would like to hear how people like it (or not), how they interpret it, and what they think of my interpretation. With The Fifth Element or possibly Ghostbusters in the surprise 13th spot. I got a little spooked when half my list was gone before my second pick, so I bumped up Pilgrim, thinking it the most likely of my top five to get snatched. Otherwise, things went fairly smoothly from there. Amelie (2001): A very whimsy and very French rom-com (of sorts) about an impish young Parisian woman with a child-like naivity and overactive imagination. She sets out to become a mischievous do-gooder by tricking people close to her into being happy, and by happenstance, finds a love of her own. It's difficult to fully capture the essence of this film. Its structure is part early 00s rom-com and part children's story book. The crux of the plot is based on an intrepration of a specific Renoir painting, if that makes sense. The narrative gets a little overtly saccharine and distractingly strange, but Audrey Tautou is positively lovable as the titular Amelie, and the cinematography is otherworldly gorgeous. I skipped picking it because, up until literally today, I had only seen it once more than a decade ago and remembered liking it, but wasn't sure I still would. Now after seeing it again, this probably would have been my 14th pick. Run Lola Run (Lola Rennt) (1998) The yin to Amelie's yang, a bold, loud, kinetic German, um, crime thriller (?) about a young Berliner woman who has 20 minutes to come up with 100,000 marks or her boyfriend is dead. You see her frantically run around the city to do this seemingly impossible task 3 times, as the clock rewinds after each attempt. 20 years later this still pulses with energy. I held off on taking it because I've drafted it before. The Big Short (2015) A simultaneously sobering and hilarious telling of the lead-up to the '08 housing market crash and Great Recession. An All-Star cast covering in-depth and wonky financial jargon in a way a common audience can understand (including Margot Robbie in a bubble bath explaining subprime loans). Also manages to really humanize an economic crisis. Loved this movie the one time I saw it a few years ago. And that's why I didn't rush out to pick it: only saw it one time a few years ago. Still on my radar though. Moneyball (2011) As an A's fan I admittedly come into this with a little bias, simply because its fun to see my team in the spotlight. But I honestly think I'd have affinity for the film's premise regardless of the team portrayed on screen - especially considering it strays so far from the truth anyway, it might as well be straight fiction. Far and away the best scenes are the "shop talk" between Billy Beane and totally-not-a-real-person Peter Brand. I've always enjoyed the behind the curtain peek at the wheeling and dealing GM life, and I think this is among the best films to capture that specific essence of professional sports. Ultimately, it's tough to take seriously a movie supposedly about the 2002 Oakland A's that doesn't even reference Mulder, Hudson, and Zito among other strange alterations and omissions, but its well-written witty banter is golden. Shakespeare in Love (1998) This movie had no business winning the Oscar for best picture over Saving Private Ryan and I hated it for years out of principle. But when I finally grew up and got over such pettiness, gave it a chance and found it among the more enjoyable "rom-coms" out there. If I was going to tab a movie of that genre for my list, I've found this to be a lighthearted and entertaining one. Sneakers (1991) Basically a "poor man's" Ocean's Eleven from a decade earlier. Ensemble cast gets together for light-hearted caper hijinks. There are a few jarringly heavy moments, especially in he middle, that throw some cold water on the fun, but otherwise it's a cool ride all the way through. This combined with Out of Sight is what I meant with recreating Ocean's Eleven in the congregate. By the way, while I wasn't planning on taking them, I'm shocked no one picked: Braveheart, The Usual Suspects, The Last of the Mohicans, Office Space, A Few Good Men, Vertigo, Breakfast at Tiffany's, Reservoir Dogs, The Good The Bad and the Ugly among several others. This draft was full of surprises. Made it a lot of fun. Incidentally, I discussed this movie draft with my dad and he said The Great Race would have been his #1 pick. It's just a question of whether the cabin will be big enough to hold all the required Brandy. Oh and I actually prefer Last Crusade to Raiders just a bit. Every scene with Sean Connery in it just pops off the screen. Of course Indy's dad would be James Bond! It's too perfect. I was very tempted to pick that one up at several points in the draft just because it was still there but I had a plan to stick to.